Our memory foam mattress was 80″ long. Our bed panel was 73″ long. Time to cut the mattress down to size. The traditional tool for this is an electric carving knife with two reciprocating blades like a mini hedge trimmer. We don’t have one, so we clamped the foam to compress it, then sliced it with a razor blade. It worked really well, with a smooth, straight cut line. Our mattress is actually a memory foam mattress topper from Ikea. It’s a regular 60″ x 80″ Queen mattress size. 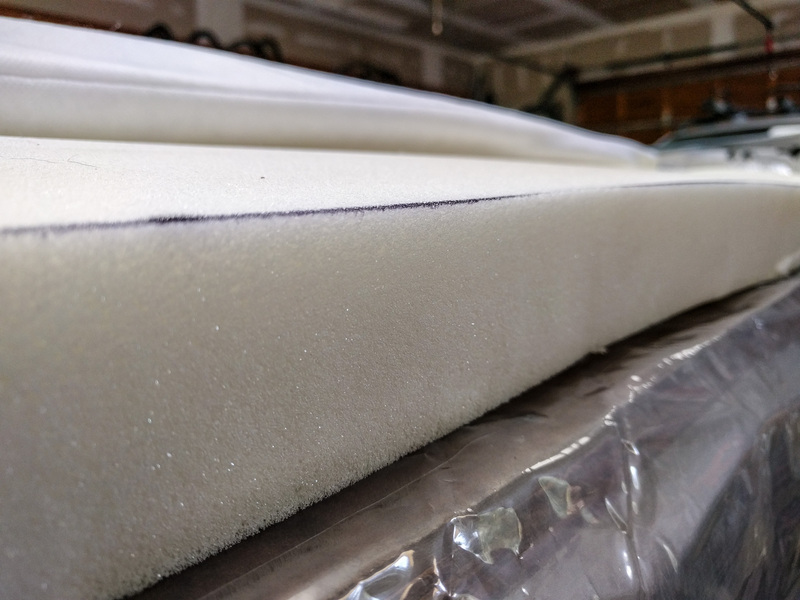 Because we want to be able to sit on our bench seat which we moved back to the third passenger position, we had to make our bed panels 73″ long rather than 80″ long. That’s still plenty of room to sleep on, but it means the mattress overhangs the end. First we took the mattress out from its fabric cover. Then we marked the correct length to remove using a marker pen. 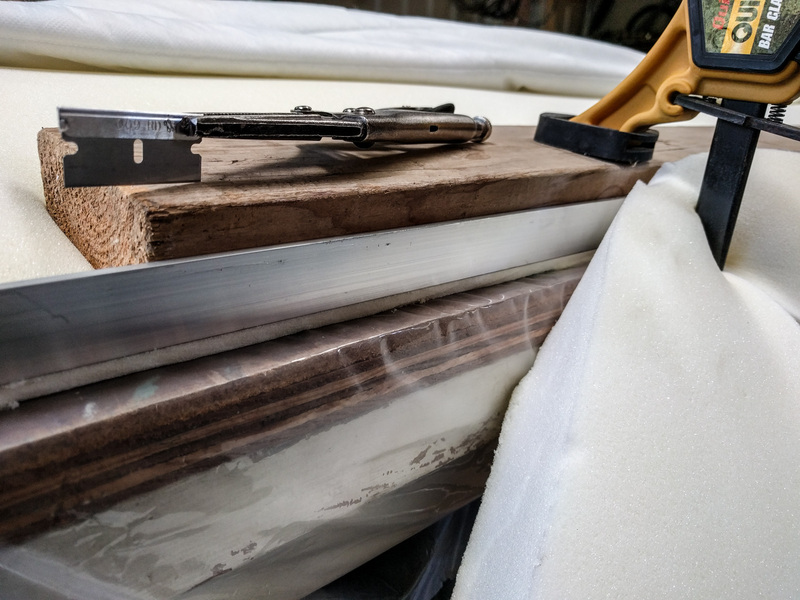 To compress the foam, we clamped it to the edge of a workbench using a piece of 1″ aluminum angle. In the picture, you’ll see the angle has a 2×4 block of wood behind it. That helped smoosh the foam down and gave the clamps a better surface to hook on to. The foam wanted to bend out of true in a couple of places. The marker pen line helped us to keep it straight as we tightened the clamps down. Once the foam was compressed, we just pulled a razor blade across it. We held the blade in some pliers to reduce the quantities of blood that would otherwise have been spilled. The end result was a smooth, clean cut. You can see how closely it followed the marker line. We put the foam back in its fabric cover and used safety pins to fold the excess fabric out of the way. Because the mattress always has a sheet over it, the extra little bit of cover material will never show. You can buy special “RV sheets” or “Short Queen sheets” that are 75″ long. we haven’t bothered yet because the regular ones tuck under just fine. Nicely constructed website, thank you!